I wrote a post a few months ago about negotiating and managing multi-brand sponsorship. Then, just this past week, I stumbled across a 2013 post by Oxfam, showcasing the best performers in their Behind the Brands Scorecard. 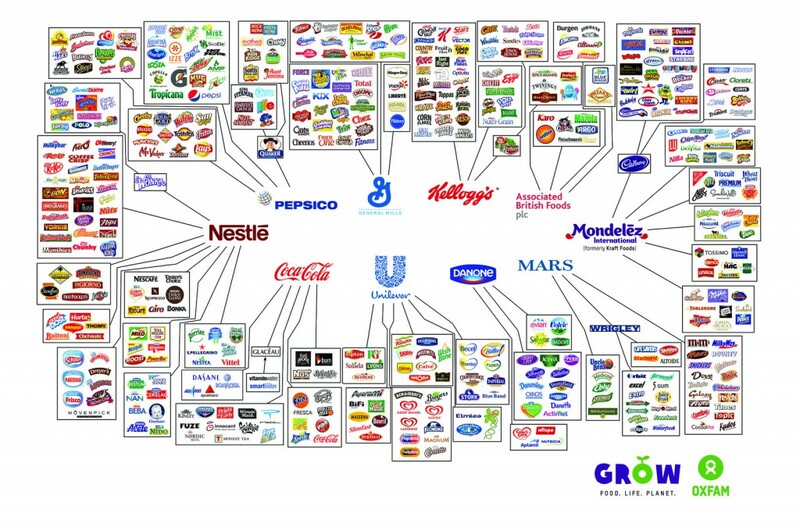 That is, in and of itself, really interesting and should be read, but they also created an immensely useful infographic for understanding what companies own what brands in the consumer foods space. You’ll see that ten giant companies – which Oxfam estimates cumulatively sell US $1.1 billion a day – own almost every major food brand we see in our grocery stores. The infographic is over 18 months old and may be a little out of date, but would still be very close to the current situation. To read the whole fascinating article, “10 everyday food brands – and the few companies that own them”, and see a much larger version of this great infographic, just follow this link to the article on Oxfam. This is a tricky one. Just because General Mills owns dozens of brands doesn’t mean that they are automatically related to each other. The various divisions – indicated by the sub-groupings – may have almost nothing to do with each other, particularly in big markets. Smaller markets probably run with leaner teams, and that often leads to more collaboration between those teams. If you’re going to approach a company for multi-brand sponsorship within one brand group (recommended), you need to find a marketing decision-maker who works across the group. That is likely to be something like, “Group Brand Manager – Chocolate” or “VP Marketing – Cereals” or “Group Marketing Director – Frozen”. In other words, you’re looking for either a major title (eg, Vice President) or the word “Group”, followed by a description of the category. That might help you with your Google/LinkedIn search for your best contact. This is a trick that some companies try. They say they’re only sponsoring with one brand, so should only be paying for the benefits they’ve got, but they define their exclusivity across a big swath of their brand portfolio. This allows them to block their competitors, but it stops you from selling other categories. For instance, let’s say you have a breakfast category to sell, as well as a snack food. You may approach a Kellogg’s breakfast cereal brand, but you should know that they also own a range of snack foods. What you don’t want to do is sell exclusivity to Kellogg’s across other categories, if they’re only taking up one category of sponsorship. This isn’t something you should necessarily be pro-active about, but do be vigilant. If you are only pursuing one category, ensure your proposal, and all subsequent communications right up to the contract, very clearly spell out the degree of category exclusivity they are getting. If they try to extend that, you can offer to sell them another sponsorship for one of their brands in that category, or tell them that you will need to increase the price to make up for the revenues you can’t pursue. If they start throwing their weight around, you’ve got a Sponzilla on your hands and you should think very carefully about whether you want to do business with them. What Sponsorship Topics Do You Want Me to Blog About in 2015? What's the Best Layout of a Sponsorship Deck and the Acceptable Number of Pages?